Southern Water has started installing water meters made by Israeli company Arad. This company is deeply engaged in the occupation of Palestinian lands that Israel over-ran by force in 1967 and has since peppered with hundreds of illegal settlements. Arad works extensively in the illegal Israeli settlements in the Palestinian West Bank. Not only has it installed 3,200 water meters in the illegal settlements of Ariel and Barkan, it has committed itself to a "..long term engagement including continued development and continuous service and support over the years." In both the Brighton and Lewes areas, residents have refused to allow the installation of Arad water meters. Southern Water's Israeli water meters now come to Hastings - so does the boycott. 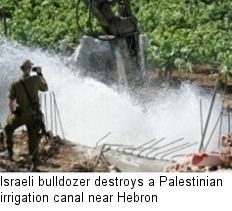 Israel's water theft is quite blatant. It regularly blocks infrastructure projects that would improve existing water supplies to Palestinians and uses water as a tool in the ethnic cleansing of Palestinian communities. Water is denied to these communities as a way to push them off the land so that their land can be expropriated by the settlements. Palestinians can be shot at and imprisoned for trying to get more water, while the Israeli army and armed settlers repeatedly vandalise and destroy Palestinians' pipes and cisterns. Amnesty International, in its 2009 report, stated: "Israel uses more than 80 per cent of the water from the Mountain Aquifer, the main source of underground water in Israel and the Occupied Palestinian Territories, while restricting Palestinian access to a mere 20 per cent." Amnesty International also reported: "In some rural communities Palestinians survive on barely 20 litres per day, the minimum amount recommended for domestic use in emergency situations. Some 180,000-200,000 Palestinians living in rural communities have no access to running water and the Israeli army often prevents them from even collecting rainwater. 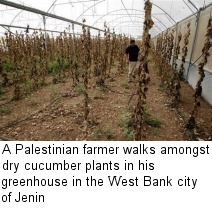 In contrast, Israeli settlers, who live in the West Bank in violation of international law, have intensive-irrigation farms, lush gardens and swimming pools." In both the Brighton and Lewes areas, residents have succeeded in forcing Southern Water to provide alternative water meters. Quite often residents have had to be particularly determined in the face of Southern Water's rigidness. The company will make threats to implement a 'No access Charge.' The customer needs to make it clear that s/he accepts the installation of a water meter, but not one made by Arad. The customer needs to request an alternative. Accounts of the campaigns in Brighton and Lewes can be read here. Our leaflet 'Make Waves at Southern Water: Say NO to an Arad meter' is here. Hastings Palestine Soidarity Campaign has sent a letter to the Southern Water CEO stating our objections to the installation of Arad meters. "Israel systematically blocks the development of the Palestinian wastewater and sanitation sector through bureaucratic constraints imposed by the Joint Water Committee and the Israeli Civil Administration. Between 1995 and 2011, only 4 out of 30 Palestinian wastewater treatment plant proposals were approved by the Committee and their construction has been repeatedly delayed. Richard Falk, a UN special rapporteur on Palestine. His report can be downloaded here. Southern Water's "Sustainable and Ethical Trading Policy" declares its intention to do "business in an ethical and sustainable way." Its disgraceful business partnership with Arad shows that it has failed dismally. While Southern Water appears content to carry on working with a company complicit in the illegal practices carried out by Israel, there are large international businesses that have made a clear, ethical, decision to sever links with companies involved in the occupied territiories. In September 2013, Holland's largest engineering company Royal HaskoningDHV terminated its contract with the Jerusalem municipality to build the Kidron wastewater treatment plant intended to service illegal Israeli settlements in East Jerusalem. In December 2013, Vitens, the Netherland's largest drinking water supplier announced that it would discontinue all joint ventures with Israel's national water supplier Mekorot in protest against the Israeli company's operations in the West Bank, citing Israel's violations of international law. "Vitens attaches great importance to integrity and adhering to (inter)national laws and regulations," an official statement from the company said. A proposed $170 million water treatment plant deal with Israel's Mekorot firm has been suspended by authorities in Buenos Aires in Argentine.